The Project: Take an amazing view of Lake Ontario and make it last forever, giving us a place to swim with a growing family. The Escape: One of the first infinity pools to be found on Lake Ontario is still our favorite. With a house situated high above the lake, this view made for the perfect backdrop for an infinity pool. With natural access areas designed into the shape from either side, the center round area makes for a perfect patio seating area to enjoy the view when you aren’t in the water. Surrounded by forest on each side, this back yard is the ultimate escape. Designing an infinity pool is a matter of angles. From above, it looks like a pool with a waterfall along the entire edge. At water level, the scene goes on to the horizon. The waterfall drops into a catch basin which collects the leaves and debrief into the filter. The edge of the infinity pool has to be precise as it is what keeps the water flowing evenly across the entire surface. Lights under the pool surface make it even more enjoyable to come out after sunset, removing the surface and producing an enjoyable glow for on everything it finds. Utilizing an automatic fill canister, you never have to refill your own pool water again. 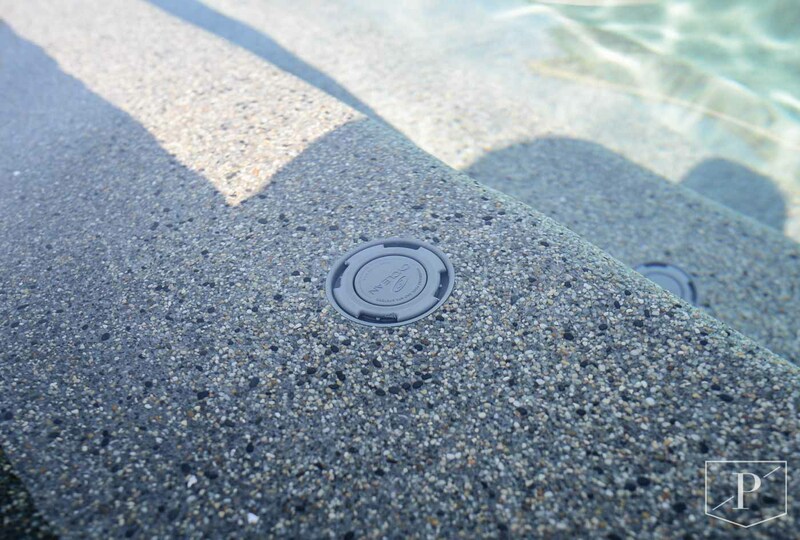 The system is buried parallel to the pool surface and incorporates a float system that matched the level of your pool. When your water drops low, the connected water line is opened from a valve and water enters the pool. It is a mechanical system with no electronics without incurring costs to maintain a perfect water level. The problem with pools is that sediment and debris can settle in areas and collect around the floor of the pool. An in-floor cleaning system changes that entire concept. By spacing out retractable water jets around the floor and stairs of the pool, water can be diverted to flow in different directions, preventing any dirt from settling. You can adjust the schedule of when it runs, and change the patterns of flow to truly optimize your pool cleaning, without any effort. While your pool filter works to keep your water visibly clear, an ultraviolet water sanitizer takes care of all the things you can’t see. As water circulates through the sanitizer chamber the UV light immediately inactivates 99.9% of micro-organisms and algae which are resistant to chlorine. A pool heater can dramatically increase and extend your swimming season. For an outdoor pool it means extra months of fun, for an indoor pool it means perfect water year round. With a titanium immersed heating element, these heaters have reached an incredible 96% thermal efficiency.